Originally posted on medium here. As some readers know, Nest makes its intelligent thermostats more attractive to American consumers by offering rebates for the devices, but you might not know that the rebates for the thermostats vary based on zip codes. This blog investigates which US regions have higher or lower rebates and shows the results visually. 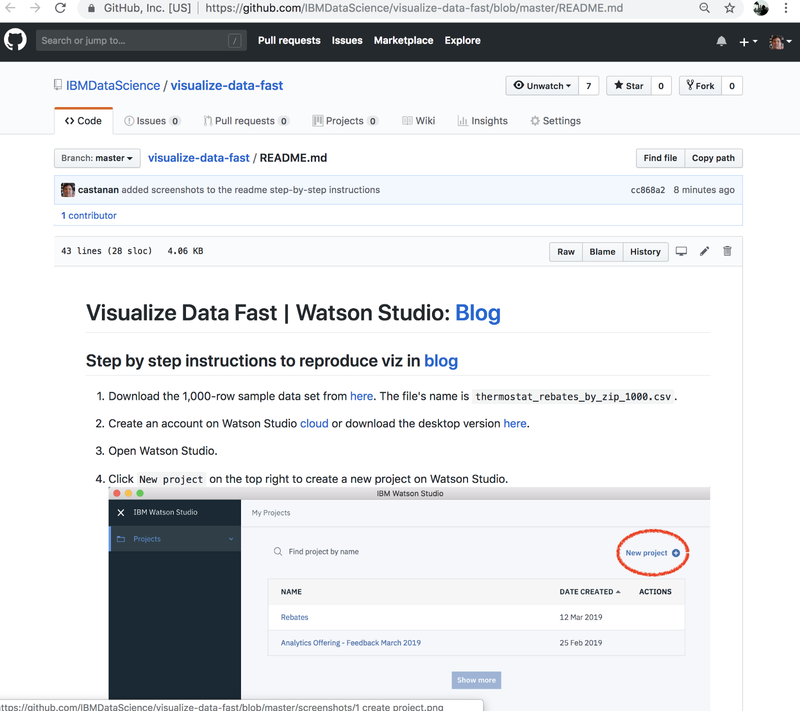 For this analysis, I used IBM’s Watson Studio, which makes interacting visually with the data easy and fast. 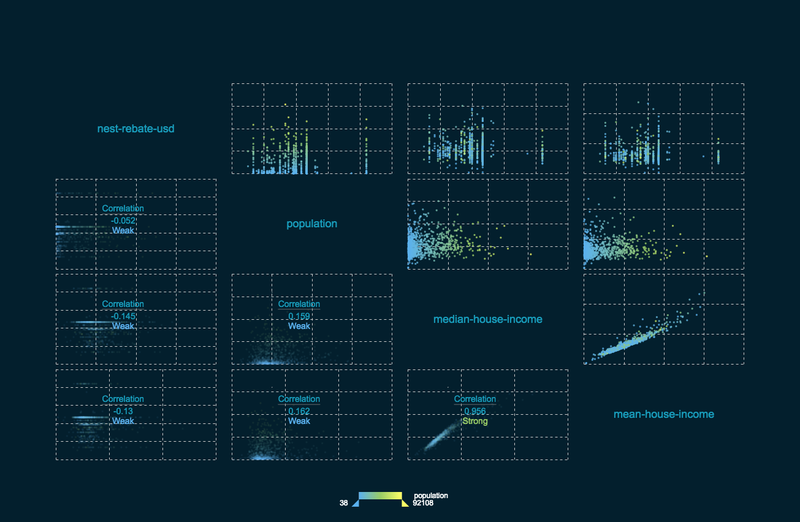 Let’s start with data distributions, which will give us an overview of all the possible values, as well as how often they occur. In visual terms, that means drawing a histogram of the thermostat rebates. For simplicity, we can use a uniform sample of 1k rows taken from a larger data set. 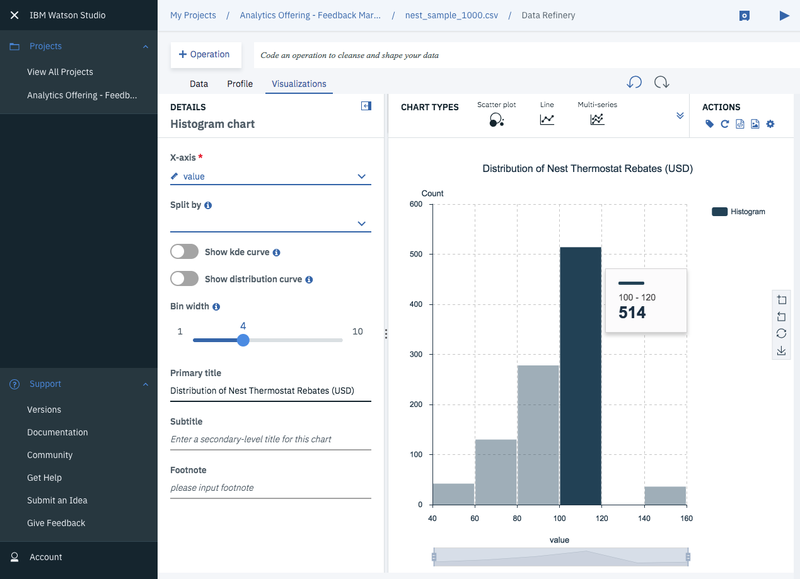 The Data Refinery tool in Watson Studio lets you draw histograms of your columns easily, as well as many other charts that may involve more than one column at a time (scatter plots, time series, to mention a couple). I noticed that North California’s rebates were lower than most of the other regions in the US. I also noticed that most of the largest rebates were in Texas. Honestly, I’m still not sure why that is. If you have guesses, certainly let me know. 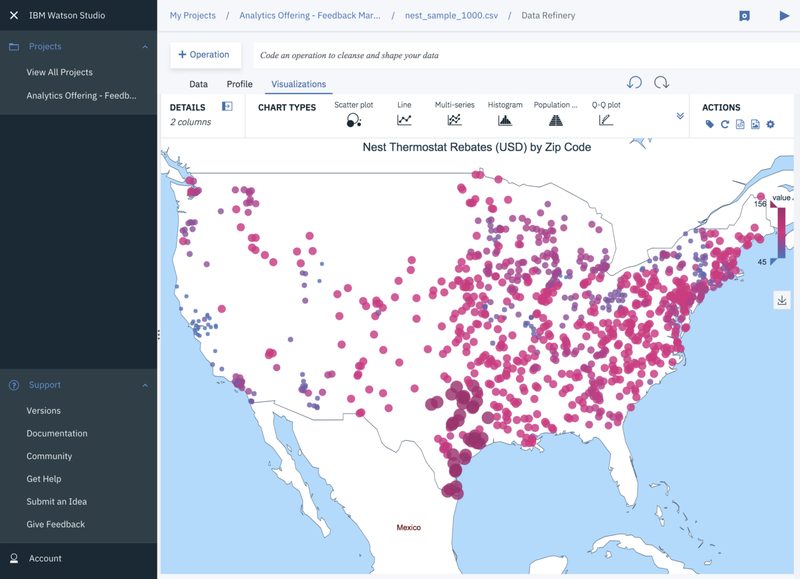 The Data Refinery tool in Watson Studio have maps that you can use to lay down longitude/latitude data, and it let you configure the color spectrum easily with any of the columns of your data set. To take a deeper look at the thermostat rebate distributions, I did a join by zip code to bring in additional demographic features like median and mean household income, as well as population size. None of these zip code demographic characteristics appeared to correlate in a linear way with the Nest rebates. The only strong correlation is between mean and median household income, which is not surprising. 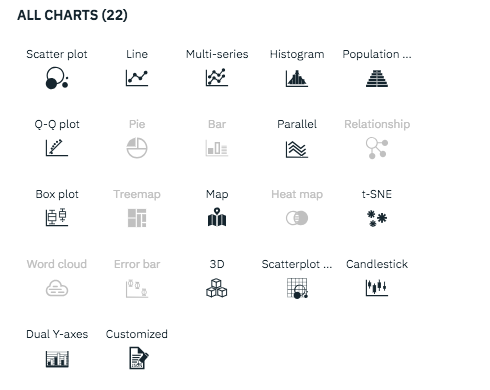 Correlation Plots Created with Data Refinery.